Discover Hong Kong’s living history with an amazing one hour sightseeing journey aboard a unique 1920s style tram featuring an open top upper deck and a vintage cabin lower deck. Travels between Western Market and Causeway Bay (ticket only). This afternoon tour begins in Central where you board a tram and head west. Stroll Bonham Street and Cat Street with its antique shops and art galleries; see Man Mo Temple, Hollywood Road’s strange mixture of shops and visit a cafe well-loved by locals. Enjoy a 90 minute evening cruise with unlimited drinks. 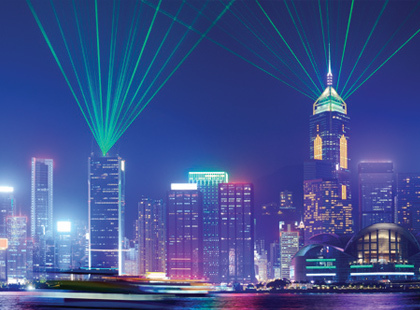 See more than 40 buildings on both sides of the harbour erupt in coloured lights, laser beams and searchlights performing a synchronised 20 minute display to music. A morning visit to the central business district, Stanley Market, Aberdeen Harbour and Repulse Bay and see the fantastic view from Victoria Peak. A short junk ride around Aberdeen Harbour is optional and payable locally. During this two hour tour, the chef will unveil the secret recipe of Dim Sum and guide you in creating your own. This Cantonese style snack is a tiny dish stuffed with various ingredients. Enjoy this hands-on experience and feast on your own creations. Enjoy Macau, the Orient’s oldest colonial settlement. Travel by catamaran from Hong Kong and on arrival you’ll see the Macau Tower, A Ma Temple, St Paul’s Ruins and take a walk through Senoda Square. There’s also a short visit to a casino where can try your luck. Includes lunch.